After the success of ‘Student of the year’, Varun will be again seen essaying a role of a charming student who is the pulse of the college. Touted to be one of the biggest entertainers of the year, Main Tera Hero sees Varun Dhawan, Ileana Dcruz and Nargis Fakhri caught in a love triangle. Father-son duo David Dhawan and Varun Dhawan pair up for the very first time. ‘Main Tera Hero’ starring Varun Dhawan, Ileana D’cruz and Nargis Fakhri in the lead roles, is all set for the Dubai launch on Friday, March 28th. Organized by Dream Advertising & Ministry of Events, Dubai. 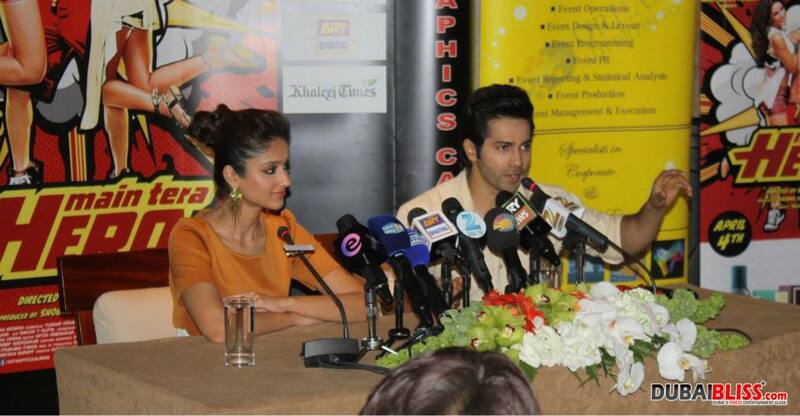 You can also party with Varun Dhawan, Ileana D’cruz and Nargis Fakhri in Dubai at CLUB BOUDOIR. For more info on the after party click the flyer. Next articleSplash It Up This Spring!